This mouthwatering coffee cake is made even more scrumptious with the addition of fresh, ripe blueberries. 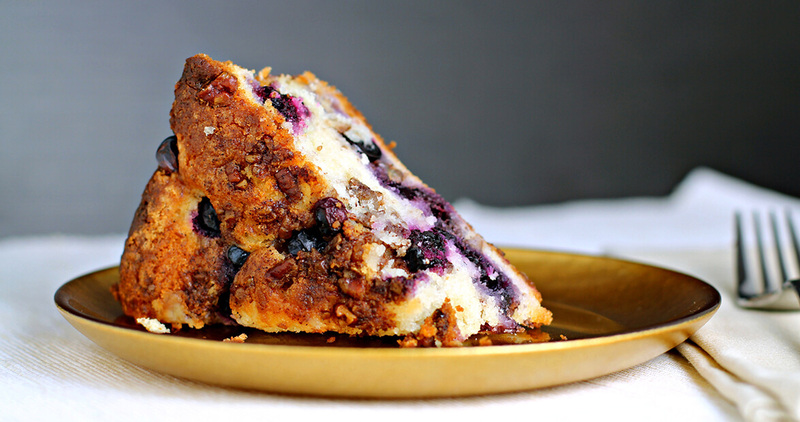 You’ll never want to make coffee cake without blueberries again. Preheat oven to 350°. Grease and flour a tube pan. In a large bowl, cream together the butter and two cups of sugar until fluffy. Add the eggs, one at a time, beating after each addition, then fold in the sour cream and vanilla. In a separate bowl, whisk together the salt, baking powder, and flour. Fold the flour mixture into the butter mixture, stirring just until combined. In a small bowl, combine remaining two teaspoons of sugar with the nuts and cinnamon. Pour one third of the cake batter into the prepared pan, followed by one third of the nut mixture, and then one third of the blueberries. Continue alternating these layers until all ingredients are used (ending with blueberries). Bake for an hour and 15 minutes, or until a toothpick inserted in the center comes out clean.